areas of concern for forest law enforcement and governance. directly with conversion timber, though they do sometimes cover questions of land tenure and ownership. Those that aim to source sustainable (as opposed to legal) products generally do cover conversion timber, though the design of these policies has often caused some controversy. 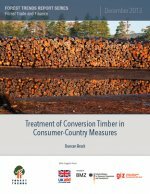 examines the treatment of such conversion timber under the various certification, licensing, procurement and supply chain control measures currently being implemented.